Trouble viewing this email? View online at https://www.bamsl.org/LegalPulseSTL. 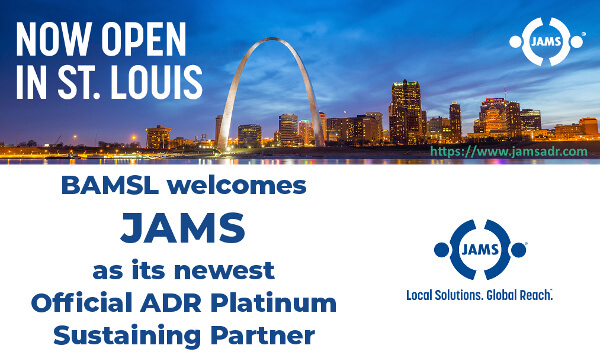 BAMSL is pleased to welcome JAMS as our newest Official ADR Platinum Sustaining Partner for the 2019-20 bar year. of neutral is crucial. JAMS handles an average of 13,000 cases per year in hearing locations around the globe. Welcome aboard. 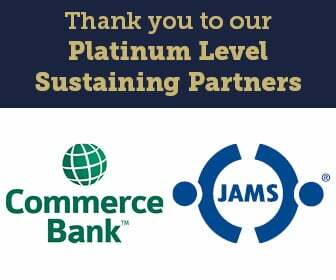 All of us at BAMSL are excited to partner with JAMS. Don't miss out on all the great things BAMSL has planned for you for the 2019-20 bar year, which begins on May 1 and officially kicks off at Law Day on May 2. Renew your BAMSL membership before April 30, 2019, to continue receiving all the perks of a BAMSL membership. You can easily pay online by visiting http://renew.bamsl.org. Set it and forget it: While renewing, make sure you enroll in automatic renewal to make it easier each year. Just provide your credit card information and mark the box for automatic renewal. We will send you a reminder each year that your credit card will be charged on May 1 each year for your BAMSL membership dues. Renew online today or look for the renewal notice in the mail this week. Thank you for renewing your membership and continuing as valued members of BAMSL. The 40th Annual Judge Kintz Memorial Bench & Bar Conference is scheduled for May 29-31 at Camden on the Lake Resort (2359 Bittersweet Road, Lake Ozark, MO 65049). Make sure you register for the conference and also secure your hotel room at the same time, using the code BAML0519. IMPORTANT NOTICE: The hotel is sold out. Attendees may call Camden (573-365-5620) to get on the wait list and to receive information about making reservations at the Lodge of the Four Seasons. For more information and to register for the conference, please visit bamsl.org/benchbar2019. Blitz Bardgett & Deutsch, LC Gori Julian & Associates, P.C. Capes Sokol The Simon Law Firm, P.C. Gray, Ritter & Graham, P.C. Sandberg Phoenix & von Gontard, P.C. Armstrong Teasdale LLP Carmody MacDonald P.C. 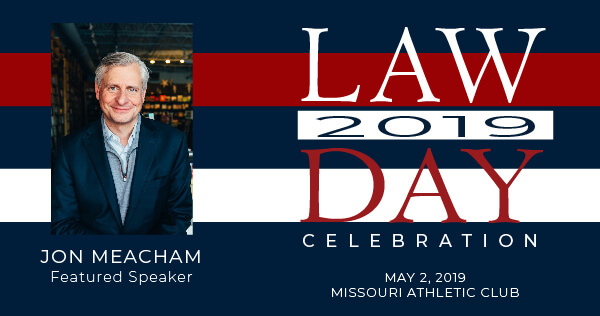 BAMSL kicks off its 2019-20 bar year with its Law Day celebration from 11:30 a.m. to 1:30 p.m. on Thurs., May 2 at the Missouri Athletic Club-Downtown St. Louis (405 Washington Ave., St. Louis, MO 63102). The American Bar Association's national theme for this year’s Law Day is Free Speech, Free Press, Free Society. The guest speaker for BAMSL's celebration is author and presidential historian Jon Meacham. The 2019-20 Board Officers and YLD Officers will be sworn in on Law Day and BAMSL will host its annual meeting in conjunction with the celebration. Additionally, a ceremony will be held for the 2018-19 Distinguished Lawyer Award, Ronda F. Williams Community Awareness Award, John C. Shepherd Professional Award, President’s Awards and YLD Awards. Visit www.bamsl.org/LawDay2019 to see this year's award recipients. For more information and to register, please visit www.bamsl.org/LawDay2019. For more information about Law Day sponsorships, please contact Zoe Linza at zlinza@bamsl.org. A special reception for BAMSL's Sustaining Members will be held 1:30-2 p.m. immediately following the program and luncheon. For more information and to become a Sustaining Member, please click here. We have a fun new venue for the 2019 Rendezvous on the Roof. This year's free member summer party is scheduled for 5:30-7:30 p.m. on Wed., June 19 at the Caramel Room at Bissinger's (1600 N. Broadway, St. Louis, MO 63102). Free parking is provided in a gated parking lot. Plan to join us and see the beautiful view of downtown St. Louis from the rooftop. For more information and to register in advance (so we have a head count), please click here. The Trial Advocacy Competition is a mock trial for licensed attorneys who are members of the BAMSL Young Lawyers Division (YLD). 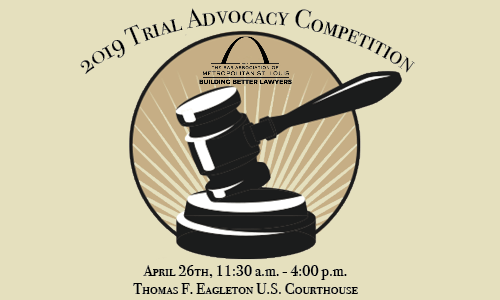 This program is an excellent opportunity for young lawyers to practice their trial skills in a realistic setting, and for seasoned trial attorneys to earn CLE credit while giving back as evaluators. This year’s competition is scheduled for noon to 5 p.m. on Fri., April 26 at the Thomas F. Eagleton U.S. Courthouse (111 St. 10th Street, St. Louis, MO 63102). We are in need of volunteer judges, evaluators and jurors. There is no fee to volunteer as a judge, evaluator or juror. Please register to volunteer here. Reminder that announcements about upcoming CLEs are now condensed into one weekly e-mail arriving every Thursday in your inbox. The weekly emails will list all upcoming CLEs with a link for more information and to register for each one. Please visit http://events.bamsl.org for all BAMSL events, details and registration information. We are currently assisting a mid-sized Clayton firm with its Commercial Litigation Associate recruiting. Qualified candidates will have 2-5 years of experience with all phases of complex commercial litigation including, but not limited to, experience conducting factual investigations and discovery, preparing pleadings, taking depositions, participating in mediation, and communicating with clients. Interested candidates should e-mail resume in confidence to jmacke@bamsl.org. Please view other open positions at http://jobs.bamsl.org. Advertising is now on sale for the June 2019 St. Louis Lawyer magazine issue. The issue will highlight the annual Law Day event along with the Law Day award winners: Hon. Booker T. Shaw, Christina Lewis Abate, Cardina Johnson, Seth Albin, Paul Brown, Mary Hodges, Joy Holley, Mark Timmerman, Sheena Hamilton, Whittney Dunn, Tamar Hodges, Megan Sterchi Lammert, Lillian Manning and Crystal Settlemoir. Please e-mail Jennifer A. Macke, Esq. at jmacke@bamsl.org to place your congratulatory ad in the issue. Ad deadline is 9 a..m. on Fri., May 17. 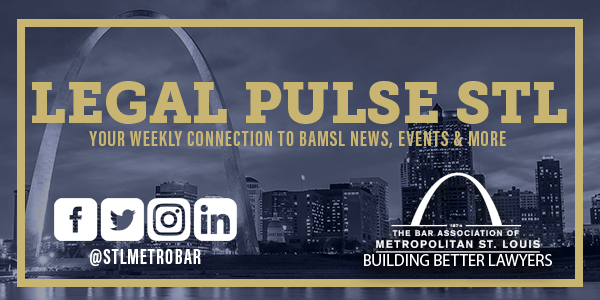 BAMSL is now selling advertising space for its Summer 2019 St. Louis Bar Journal. The issue is devoted to the topic of Construction Damages Law. If you or your firm handles construction law/litigation matters, this is your issue to advertise. For rate information or to reserve ad space, please contact Jennifer A. Macke at jmacke@bamsl.org. Ad deadline is 9 a.m. on Friday, May 31.